The exclusive pharmadocs Date Finder simply and rapidly gives a comprehensive overview of various deadlines in the marketing authorization of medicinal products – adjusted to your individual procedures. Are you planning to submit a notification of change or renewal? Do you want a quick overview of when you have to register your product in the sunset register at the latest or when the sales period for your expired approval ends? No problem: Use the exclusive pharmadocs deadline planner and get a quick and reliable overview of the upcoming deadlines. 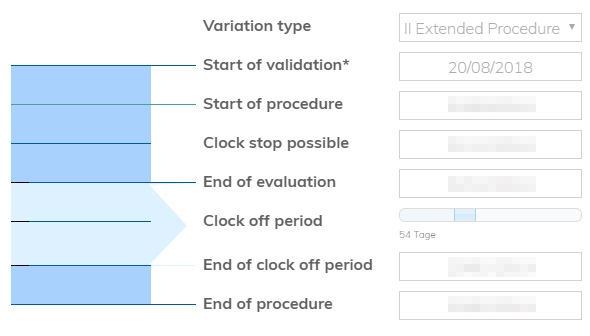 The deadline planner can be individually adapted to your data: For example, simply enter the individual start date of your procedure and add further data, such as clock stops, if required. With a single click, the pharmadocs Date Finder not only calculates the end date of the respective process but also displays further deadlines in the course of the selected process. Try the pharmadocs Date Finder! pharmadocs assumes no liability for the accuracy and completeness of the data. Doc. Ref. : CMDh/293/2013/curr. version, CMDh/294/2013/curr. version, CMDh/295/2013/curr. version, Article 24 (4,5 and 6) of Directive 2001/83/EC, AMG § 31 (4), CMDh/004/2005/curr. version.